Nothing inspires me to cook more than someone else’s cooking. The other night, I ran into my neighbor Katchen in the hall. She invited me in to her kitchen to return the rolling pin I had loaned her, and gave me a foil-wrapped package. I thanked Katchen for the treats, and since I was full from dinner I set the wrapped buns on the counter and left them for lunch the next day. I woke up later than usual, and favored a warmed bun over my standard fruit & yogurt for breakfast. I ended up eating both buns. They were that good. I’m a big believer that bacon makes anything taste better, but it wasn’t just the bacon—the filling was moist, and each of the ingredients were perfectly cooked, so the onion and peas still had some bite. As for the surrounding pastry, it was soft, pillowy—again, not too chewy—and flavorful, though not very buttery. The buns were delightful, and I could see why Katchen’s grandmother’s recipe survived: it was a simple, comforting and delicious dish. Okay, so no buns. Dumplings? Need wrappers. Quesadillas? Need tortillas. I have $1.50 in my wallet and don’t feel like going to the bank. Hmm… Pie crust! I have pie crust! I’ll make turnovers. And for filling? Time to improvise. A quick scan of the refrigerator shelves revealed some good leftovers (shredded butternut squash and cooked broccolini), an aromatic veggie (onion), and the binder for my ingredients (soft goat cheese). I didn’t have bacon, but I did have chopped pancetta, which would provide good flavor and fat for cooking the onions. The only thing missing was a filling protein, and I found that in my pantry: canned black beans. I took the crusts out of the freezer to defrost, cooked the onions and sauteed the squash. Then I lined up all my fillers on the kitchen table. Once the crusts were ready, I unrolled them gently onto a floured cutting board, and got them a bit thinner using my rolling pin. With a pizza cutter, I cut squares out of the rolled crusts, and set about filling them. I always have a tendency to overstuff when I fill anything, so I made sure not to put more than a tablespoon of each ingredient onto the bottom square of each turnover, and then sprinkled on the cheese. I also cut slits in the top square of each turnover to let steam escape during baking. If you don’t, you’ll find they’ll leak (but they shouldn’t explode, though that would be fun to see). Once the turnovers were assembled on the baking sheet, I brushed some egg wash on each one, and topped with a finely grated mix of parmesan and romano cheeses. Into the oven they went, baking at 400 degrees for 18 minutes—which is when they hit all their golden brown beauty. The great thing about this dish is that there’s no hard & fast recipe—with pre-made pie crust, all you have to worry about is filling, and you could fill these turnover with a variety of combinations: sausage, tomato, mushroom and mozzarella; corn, roasted pepper and jack cheese; cooked chicken and vegetables; or as I found in the buns Katchen gave me, bacon, peas and onions. The possibilities are endless, and this is a great dish to make if you’re clearing your fridge or pantry, or want to make something exciting out of boring leftovers. The only thing I’d advise is not to use anything too wet, as the turnovers will get soggy. 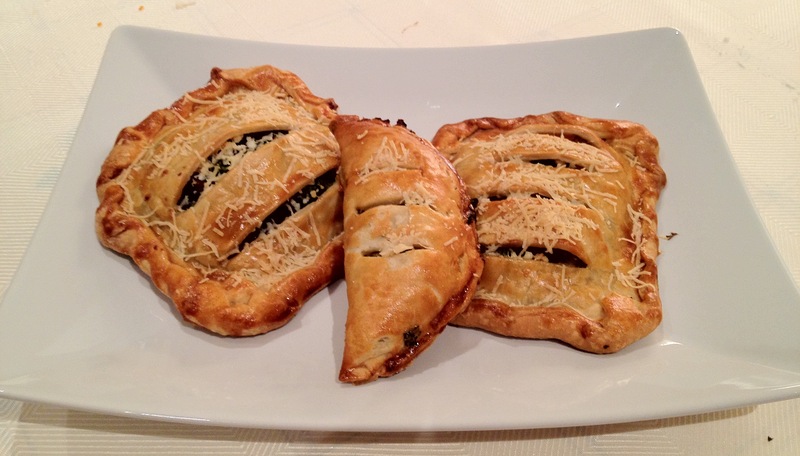 This entry was posted in Recipes, Savory and tagged appetizer, baking, cheese, dinner, easy, filling, leftovers, main, pie crust, quick, savory, turnovers, vegetables, veggies. Bookmark the permalink.